As noted, the ten finalists for the high school group are of excellent quality. To facilitate my decision, I read all of the poems closely, and then reread them a number of times (out loud also), paying attention to poetic features used. I listened to the poems - what is being said here? How well is the poet saying it? 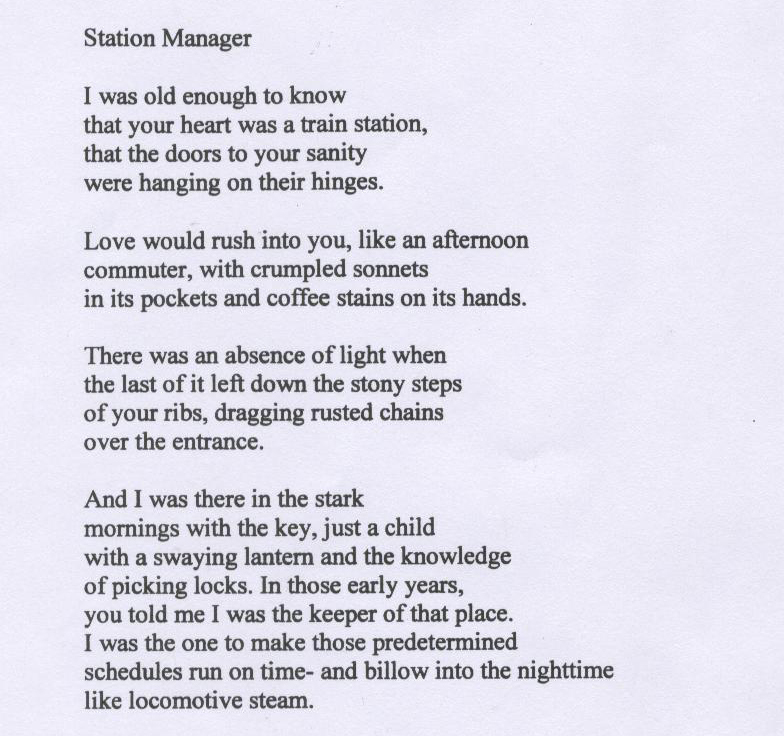 The poem, "Station Manager," asserted itself immediately as a forceful, yet tender, poem. It is a winner in this contest by virtue of its vivid and original imagery, skillful extended metaphor, excellent line breaks, and mature diction and tone. The extended metaphor in the poem compares the speaker to a young "Station Manager" - not as a director of trains and their comings and goings, but as the director of the ins and outs of an older someone's heart and sanity. The writer utilizes the jobs of a station manager in a train terminal to delineate his or her duties - and it is absolutely fitting that we do not know the relationship of the two individuals in the poem. were hanging on their hinges. The direct first lines, "I was old enough to know / that your heart was a train station" facilitate an easy entry into the poem and build suspense. The reader wants to know more about this heart, and its "doors to sanity" that were "hanging on their hinges." The title of the poem begins to have symbolic meaning beyond a simple job description, especially since the speaker is "old enough to know." The next section continues the train station metaphor. The speaker would see "love" that "would rush into you," similar to trains filling and emptying a station. This love is an "afternoon commuter" that appears and disappears on its daily grind of work with "crumpled sonnets / in its pockets and coffee stains on its hands." This expressive and explicit metaphor conjures a love that comes and goes, with "sonnets" (words of love?) "crumpled in pockets" and hands stained with coffee. The suggestion of a weary and transient love is clear, and one that the "station manager" would soothe later in the poem. I adore these lines. What economy of language to compare love's leaving to "an absence of light," (sanity "hanging on hinges"), as the "last of it" went "down the stony steps of your ribs," like the hard steps of a train station. That "ribs" are compared "to steps" is precise and original. This disappearing love also "drag[s] rusted chains / over the entrance" as if to cause more pain, more disastrous effects. The phrase, "rusted chains," perhaps alludes to the length of this once strong (perhaps restrictive?) relationship and / or to its distressing consequences. They also mar the "entrance" to this heart. you told me I was the keeper of that place. "In those early years" is an intriguing phrase; it suggests that there are newer and later years of companionship between the two characters in the poem. The speaker is told that he or she was the "keeper of that place" - this train station of a heart - and succeeded in making the "predetermined / schedules run on time." That they "billow[ed] into the nighttime / like locomotive steam" alludes to the station manager's adept skill at controlling the comings and goings of all trains, or love, in and out of this heart's station. Specific diction used in the poem adds to the meaning. Words that allude to a train station such as "afternoon commuter," "swaying lantern," "schedules," and "locomotive steam" underscore the metaphor. Words such as "rush," "crumpled," "stains," "stony," "dragging," "rusted," "stark, "picking," and "billow" are energetic and rich in meaning. I especially appreciate the use of compression in the poem; the economy of language doesn't burden the reader with extraneous knowledge. "Station Manager" succeeds very well as a poem because of its writer's skill with metaphor, diction, tone, and structure. This author's mature voice, confidence, and deft handling of language mark this poem as a winner; we need to see more from this talented writer. Thank you for the privilege of reading your work!